In the 2016 draft the Cincinnati Reds grabbed Chris Okey with their 2nd round pick. His initial taste of professional baseball was solid in 51 games. 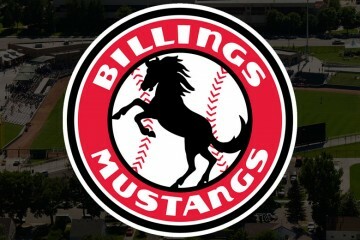 He showed off good pop in his bat with 16 extra-base hits, but battled with consistency in the half-season he played between Billings and Dayton. In 2017 the organization tabbed Chris Okey as the starter for Daytona. In the opener at Florida, he went 0-3. He followed up with a big game, going 2-4 with a double, triple, walk and three runs scored. Through the first five games of the season he was solid, going 5-19 with three walks and three extra-base hits. Over the next ten days though, Okey went 0-26 with 13 strikeouts. 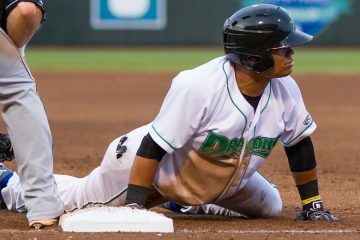 His final week saw him break out of the slump, going 5-18 for the Tortugas. The month didn’t go well overall for the catcher, posting a .159/.243/.238 line with six walks and 24 strikeouts in 70 plate appearances. May got out to a better start for Chris Okey, who had a hit in six of the first seven games – but all six hits were singles. Things slowed down from there as he went into a slump over the next eight games – going just 3-27 (.111) with four walks. 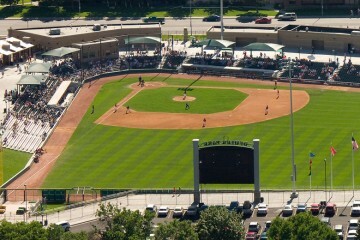 In a double header on May 20th the catcher would go 3-7 with a home run, walk, three runs and six RBI. It was a huge day in the middle of a rough stretch, but it didn’t carry forward. Over the remaining six games of the month he went just 2-20. In 23 games he would hit just .177/.261/.228. Okey cut his strikeout rate, but it was still high as he fanned 23 times with eight walks in 88 plate appearances. In limited action over the first week of June, Chris Okey hit well. It was just three games, but he went 4-9 with four walks and just one strikeout. The second week was the flip side to that, going just 3-20 with no walks and six strikeouts. There would be a week between games, thanks in part to the Florida State League All-Star break mixed in with some off days. The first two games back went well, but the second half of the month overall was another struggle. In those final nine games he posted a .587 OPS. June was a step forward, and would be his best month of the year. 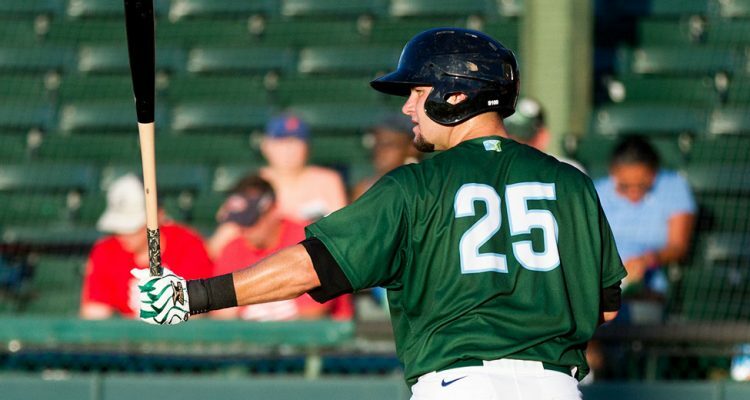 In 22 games the Tortugas backstop hit .230/.319/.295 with 16 strikeouts in 69 plate appearances. July started like most of the season had gone for Chris Okey – slow. In the first week of the month he went 4-18 (.222) with a double. It was the second week that saw him head up a little bit, doing 5-16 (.313) with three walks, a double, and a home run. The month slowed down from there – Okey hit just .171 over the final 12 games of the month. In 22 games he would post a .213/.280/.280 line with seven walks and 21 strikeouts in 83 plate appearances. The strikeout rate remained higher than you wanted to see. Chris Okey didn’t play in August until the 14th – spending the first 13 days on the disabled list. When he returned to the roster, things did not go well. In 14 games played he racked up just six hits. That came with three walks and 20 strikeouts in 53 plate appearances. He would hit just .128 over that span, closing out his 2017 season. Hitting | Despite hitting just .185 on the season, Chris Okey projects better than that. Strikeouts are a problem, but he could be a slightly below-average hitter who could fall into the .250 range in the future. Power | A broken hamate bone won’t help anyone hit, much less hit for power. As reported by Keith Law, Chris Okey reportedly played with the injury all season and didn’t tell anyone. Power was his calling card coming out of college, and he still projects for average power despite the big step backwards in this department in 2017. Running | As a catcher he’s not expected to run much, and, well, that’s good because he runs like a catcher. Arm | He showed off an above-average arm in 2017. He also threw out 33% of attempted base runners on the season. Defense | Okey made big strides defensively in 2017, going from a fringe-average defender to an above-average one. From the beginning to the end of the 2017 season, it was ugly at the plate for Chris Okey. In no month did he slug .300, and he racked up a bunch of strikeouts. In fact, he struck out 29% of the time that he stepped to the plate during the year. Things didn’t go well. At all. But, as we found out after the season, there was probably a reason to explain some of that. The hamate bone break isn’t the only thing at play, but it was probably a decent chunk of what caused some of the issues. The poor offensive numbers caused his prospect status to slip. However, don’t be so quick to write him off. Defensively he made big strides on the season. He entered the year with the reputation of being a bat-first catcher. He had enough skills to remain behind the plate but was not someone who would be known for the catch-and-throw skills. By the end of the year there were some scouts who were reporting back that he was a plus defender behind the plate. The scouting report from 2016 to 2017 was basically mirrored. He went from bat-first to glove-first over the course of the year. If the hamate injury heals, and Chris Okey can be more like the hitter that he showed the potential for being during 2016, and combine that with the defensive version he showed in the 2017 season, that’s a pretty good catching prospect. Catchers have a tendency to develop later on the offensive side of things later than players at other positions. Okey certainly has work to do to show that 2017 was an outlier at the plate, but at that position, he’s got more time to work with to show that than he would if he played elsewhere on the diamond. 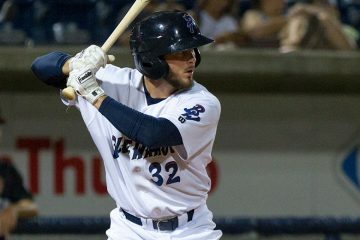 Twins outright JT Chargois, should Reds take a look? I certainly wouldn’t give up on Okey. After Seth Beer, he was the man at Clemson in 2015. I think we should be encouraged by his defensive improvement last year and hopefully he comes into 2018 fully healthy. I think many of you may enjoy this article in Fangraphs. This is a good read! It does give me hope that there is a precedent, even if its a very small one, that Senzel can pull off playing at SS they next couple years. It really would be the perfect answer for the Reds next competitive window. It would make their lineup so deep, and keep the window at 2B open for whoever is performing best (Gennett, Herrera, Long in a year or two). I like Okey and think he has a nice bounce back season in 2018. Playing through a broken hamate bone is painful especially to swing a bat. His improvement defensively while struggling at the plate is very encouraging. I don’t see a need to draft a C high in this years draft as some have suggested with Ga. Tech’s Joey Bart. The Twins have put on waivers an interesting pitcher, JT Chargois. He averaged 97 mph on his fastball with the Twins in 23 IP’s in 2016. He had TJ surgery in 2013 and missed the entire 2013 and 2014 seasons. He had pitched well after that in 2015 and 2016 with the Twins minor league teams. He has only given up 3 HR’s in his minor league career, which was 2012, 2015, 2016 and a small part of 2017. He logged 70 IP’s in 2016 at AA, AAA and the Twins. He only pitched 2.2 innings in 2017 and missed most of the season with what was reported as a stress reaction in his elbow. Twins didn’t put him on 60 day DL and its speculated that the Twins don’t think he would qualify. That is leading to speculation that the Twins are on the verge of signing a big free agent pitcher and needed a 40 man roster spot. And the Twins are trying to sneak Chargois through waivers because he missed most of last year and feel like teams won’t risk a 40 man spot by claiming him. Lots of good things said about Chargois on Twins sites. He is definitely an interesting pitcher, with an interesting arm, and also an interesting elbow history. Should the Reds try to claim him? And then try themselves to sneak him through waivers? To do so would cost the Reds a player off of their 40 man to make room. Who could they drop? Might have to get Dr. Kremcheck on deck for a medical review. Change the year in the above link to see updated scouting report. Bottom line, I think he would be worth claiming and then trying to sneak through waivers just before opening day. Only trouble is claiming him will come at the risk of exposing someone on our 40 man to waivers first. Even if we are to turn around and try and sneak him though waivers. We could end up losing him to waivers in addition to whoever we risk exposing to waivers, and end up with less than what we started with.